Abbey View is a four bedroomed, self catering cottage on the shores of Ballinskelligs Bay in Kerry, the most beautiful county in Ireland. Ballinskelligs Abbey, plundered and abandoned by the Vikings over a thousand years ago, lies just a stone's throw away perched above the shoreline. 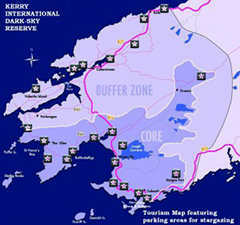 Ideal location for sightseeing and other activities such as exploring the "Ring of Kerry", walking/hiking the many trails, fishing (sea or fresh water), golfing on the many splendid courses, kayaking, or perhaps retiring to the local hostelry for some music, dancing and the craic! If it's scenic location you're after, this is a real gem on the 'Skelligs Ring'. Running from Donegal to Cork, the Wild Atlantic Way offers unsurpassed scenery in the form of soaring cliffs, beguiling bays and concealed coves, and local towns that are world renowned for their welcome and hospitality. 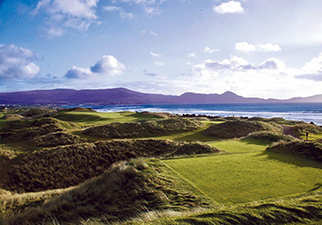 Waterville Golf Course, just fifteen minutes drive from Abbey View, has been a regular stop for the world's leading players, including Tiger Woods, A whole host of other famous names have graced this course across the decades, not least Charlie Chaplin, Bing Crosby and Bob Hope; such is its fame/challenge. 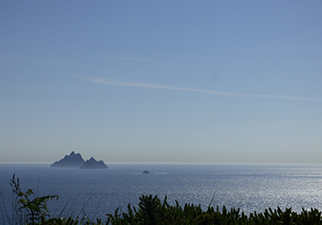 Described by George Bernard Shaw as "Not of this World", Skellig Michael is the location of key scenes in the latest Star Wars films, The Force Awakens and The Last Jedi. Other films shot in this locality include "Harry Potter and the Half Blood Prince", Werner Hertzog's "Heart of Glass" and James Stewart's "Spirit of St Louis"
Do you want to unwind? Do you want to drive down country roads and see stunning scenery at every turn? Stroll across a beautiful strand with wide sandy beach and crystal clear water? Stop off for a coffee and cake at Barbara's cafe and chat to the locals? 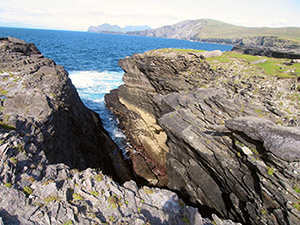 This is beautiful Ballinskelligs in Kerry. It's our secret. Shhhh! Great location for a holiday, we did a lot of touring and exploring and found some beautiful spots. Even the weather behaved itself. The trip to Skellig Michael was the highlight and exceeded our expectations. A very spacious and comfortable accommodation, we particularly enjoyed the fabulous walks in every direction, including along the beach and up the mountain. A healthier holiday you could not wish for. It was lovely returning to the area. I used to visit County Kerry with my parents when I was a child and had not forgotten the sheer splendour of the scenery. I'm sorry I can't visit more often. Everyone in the area made us feel so welcome and we loved the beach cafe and the local bars. Abbey View is a perfect base. .
We had an amazing time in Ballinskelligs and found Abbey View very comfortable and so well placed right by the sea. There is plenty to do for all ages. Step back in time to this traditional Irish Home, who needs TV or WIFI when you are gazing out on the shores of inspiration. Perfect bliss! © 2019 Skellig Holidays. All rights reserved.